Nutty Caramel Snack Mix is a delicious combination of cereal, almonds and pecans all covered in a homemade caramel sauce. 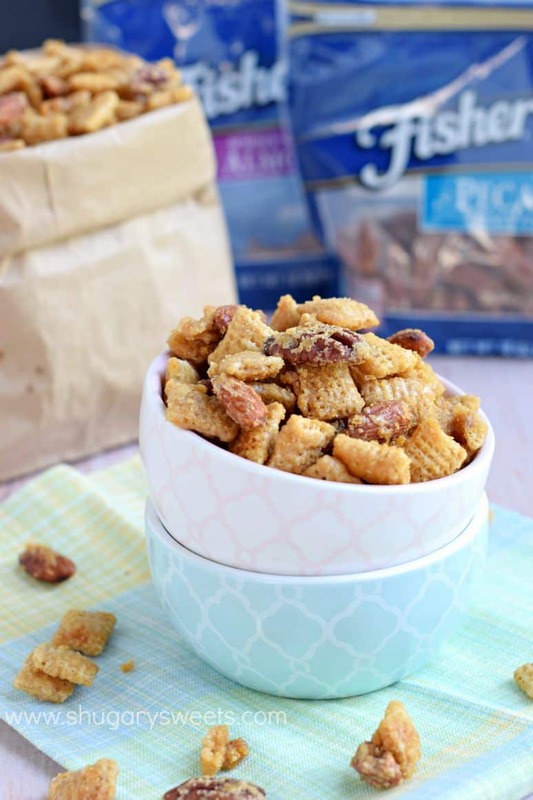 Baked to perfection, this crunchy, sweet and salty mix is perfect for family and friends, lunches and snacks! 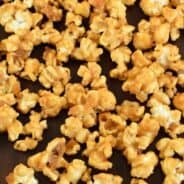 I had a craving the other day for Caramel Corn. I love the stuff, especially when it’s homemade. Unfortunately, I had no popcorn in my pantry. As I stumbled through the darkness (aka the back of my pantry) I came across a new box of rice squares cereal. 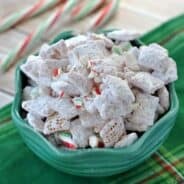 I must have envisioned myself making some puppy chow at one point, but never got around to it! As I grabbed the rice cereal and went about making the caramel mixture to coat it, my mind floated back to childhood. Specifically those red and white boxes of Cracker Jacks. And how I used to LOVE LOVE LOVE when mine had a tattoo prize inside. Which is ironic, because if you know me, you know I am not one to put a tattoo on my body. Not because I’m against them, but because I hate pain, haha!! Anyway, while I was thinking about that snack, I decided to toss in some nuts to today’s snack mix. I mean, it’s such a great combo…the crunchy caramel cereal with some caramel coated nuts. Fortunately, I had a bag of Fisher Pecan Halves and a bag of Fisher Whole Almonds in my pantry (in the front, not the back, in case you were curious)! I knew this was going to be a great decision. I love candied pecans, and basically that’s what these are too! Use a medium sized saucepan to bring the caramel to a boil. Boil for one full minute, then remove from heat. Quickly whisk in the baking powder and vanilla extract. The mixture will become frothy! Pour this over your cereal and nuts in a very large bowl. 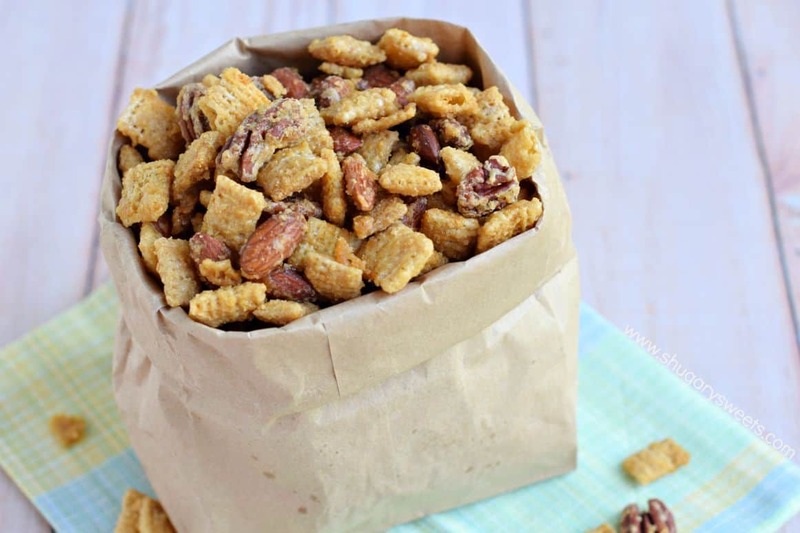 I like to use my broiler pans to bake this snack mix. They are deeper than a cookie sheet (however, a cookie sheet does work too, just have to be more cautious when stirring). I line my pan with foil to make easy clean up. You can also use disposable foil pans if that works best for you! Just make sure you try to have a single layer of snack mix on your pans (it cooks better this way). You’re going to cook this over low heat (250 degree F) for an hour. Every 15 minutes, remove from the oven and stir (I use a pancake turner and just flip the snack mix, allowing the caramel from the pan to go back over the snack mix). Once this is done cooking, dump it onto a large piece of parchment paper on the counter to cool completely. I urge you to not take a bite immediately…that caramel can be HOT! Once this has cooled completely, it will also become crunchy. NOW you can eat it. I store mine in a large airtight container, or a couple gallon sized Ziploc bags. 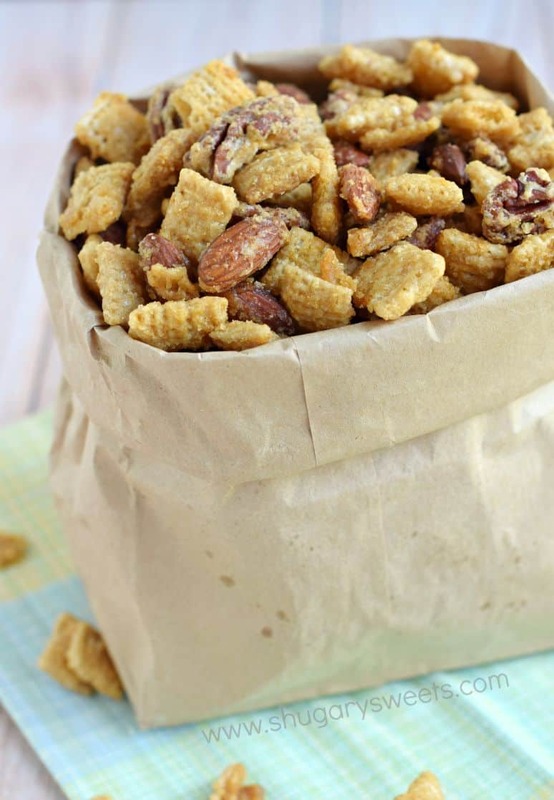 If storing in the bags, squeeze the air out of the bag and the snack mix will stay fresh for a little over a week!! ENJOY. Preheat oven to 250 degree F. Line two broiler pans with foil (cookie sheets, or large disposable pans work too). Set aside. In a medium saucepan, combine butter, brown sugar, corn syrup and salt. Bring to a boil, stirring constantly. Boil for one full minute. Remove from heat. Quickly whisk in the baking soda and vanilla extract. This will make the caramel become frothy. In a large bowl, combine the cereal and nuts. Pour caramel mixture over cereal and stir until everything is coated evenly. Pour onto prepared pans. Bake for one hour, stirring every 15 minutes, making sure the caramel continues to coat the cereal and nuts. Spread hot mixture onto a parchment paper lined counter top. Allow to cool completely. Store in airtight container and enjoy! 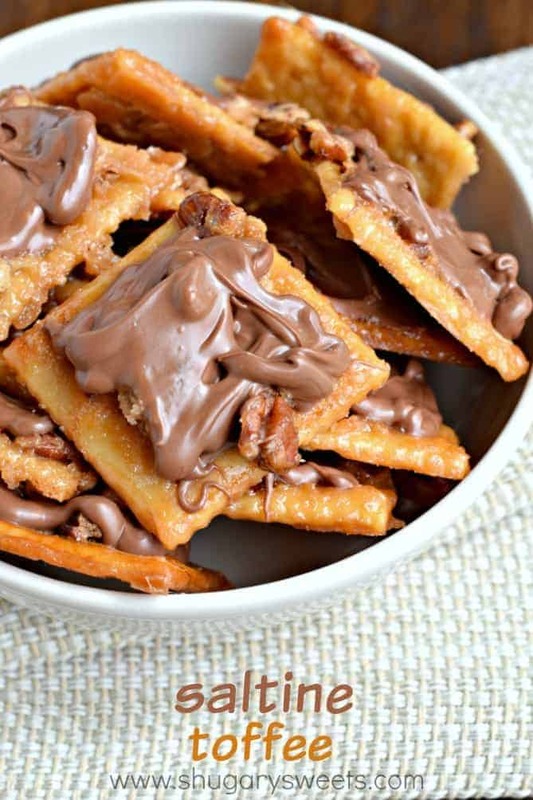 Saltine Toffee: use Fisher pecans to create the most delicious sweet and salty treat ever! 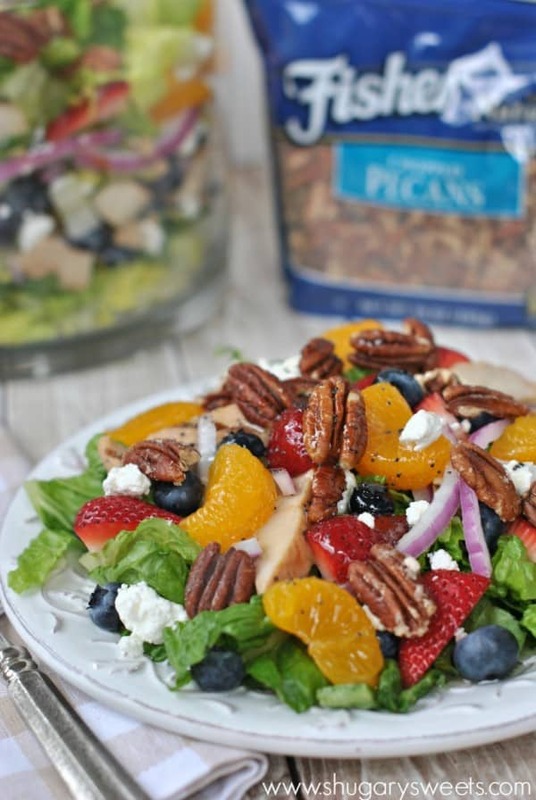 The sweet dressing and fruits are the perfect compliment to this Strawberry Pecan Salad. 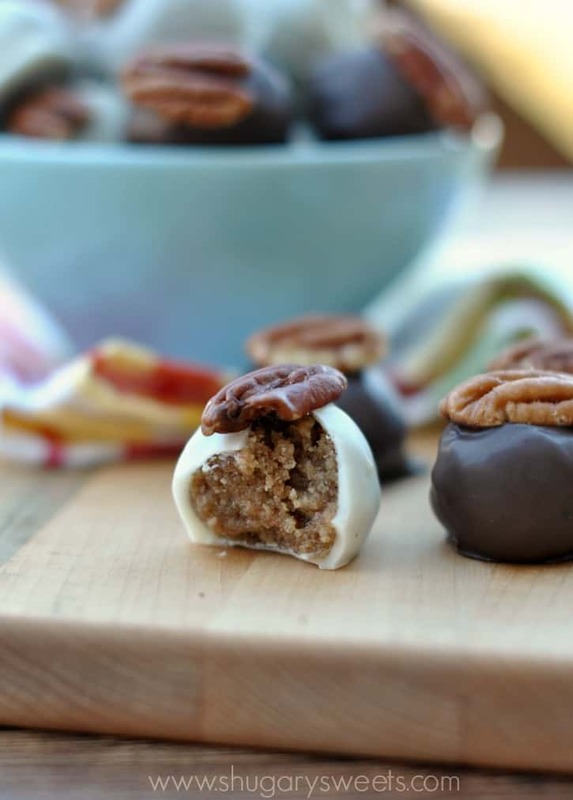 Pecan Pie Truffles: one of my all time favorite candies! **This is a sponsored post on behalf of Fisher Nuts. I’m a part of the Fishers Fresh Thinkers. I was compensated for my time, however all opinions expressed are 100% my own! 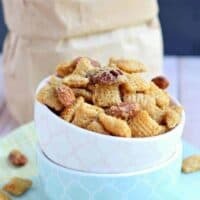 This snack mix hits all the right spots! It looks SO completely addictive. 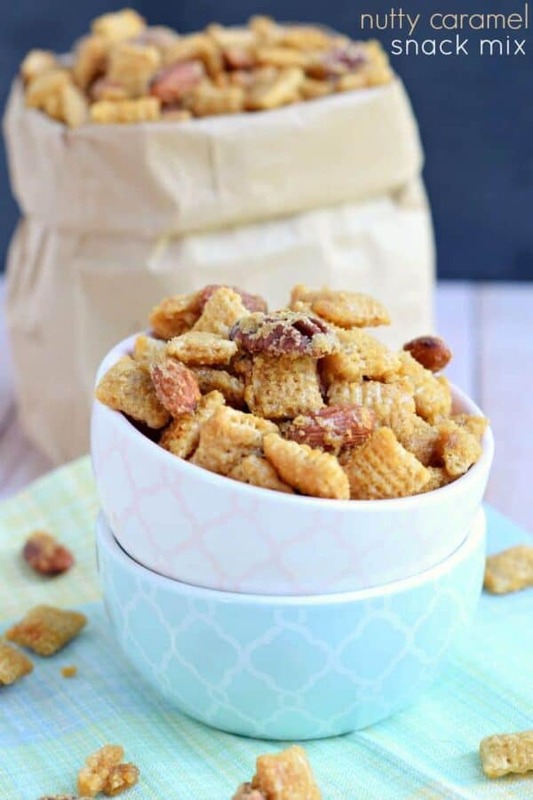 I am obsessed with crunchy nut mixes and I definitely need to try this recipe! I love the addition of the caramel! I love snack mixes. This is right up my alley! Yum. We are on the same wave length because I’ve been learning how to make caramel corn this week, unsuccessfully so far.. I think I keep burning the caramel! I’ll have to follow your tip of boiling for just 1 minute! Oh, how I love sweet and salty snack mixes like this one! I wish I had a big bag of this for traveling in the car today! This snack mix is coming with us on our next road trip! Mmmm love me some caramel corn but this snack mix looks just as good if not better than it! We are always looking for new snacks to try in the office, and we can’t help but gravitate towards anything sweet and crunchy. Can’t wait to make a big batch of this soon! I would inhale this!! 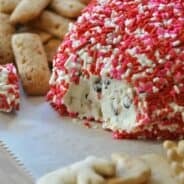 Such a great recipe idea! Snacks are my life. Add this to my list of must-haves. And it’s definitely going in my kids’ lunch boxes! I’m with Amy – snacks are my life!! Especially sweet and salty nut-based snacks! Yes please! That caramel coating looks irresistible! YUM. Sweet and salty snacks are my favorite, especially when you add caramel! Is is wrong that I just want to dive into a large pool of that? Looks divine and Fischer Nuts are awesome.